Closest relatives of hippo are whales and dolphins. 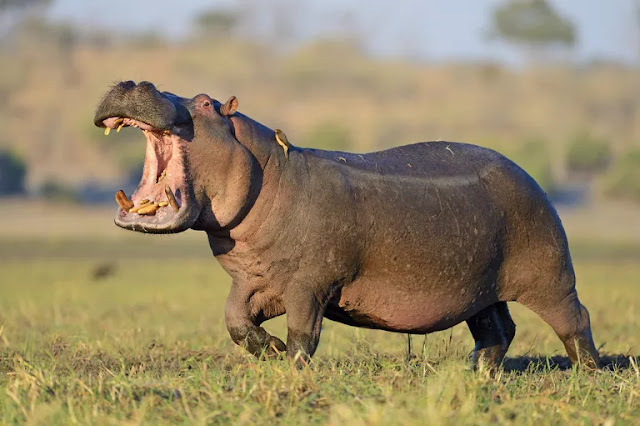 The common hippopotamus (Hippopotamus amphibius), or hippo is a large semi-aquatic mammal that is found wallowing in the rivers and lakes across sub-Saharan Africa. Their tusks-like teeth grow continuously. They are the main reason why poachers are killing hippos. The name comes from the ancient Greek for “river horse”. Pregnancy lasts 230 days. Only one baby will be born. Mother protects the baby against lions, leopards, crocodiles and male hippos. Babies drink milk one full year, but they will add grass to their diet few weeks after birth. Hippos live up to 45 years in the wild. There are two species of hippopotamus: the common hippo and the much smaller pygmy hippo. Hippos are the third largest living land mammals, after elephants and white rhinos. Hippos produce loud noise that sounds like lion's roar. They are 3.3 to 5 meters (10.8 to 16.5 feet) long and up to 1.6 meters (5.2 feet) tall at shoulders. Females average weight is 1,400 kilograms (3,000 pounds); males weight from 1,600 to 4,500 kilograms (3,500 to 9,920 pounds). A hippo’s lifespan is typically 40–50 years both captivity and the wild.The longest living hippopotamus exceeded 61 years in captivity. Hippos are a semi-aquatic mammal, usually inhabiting shallow lakes, rivers, and swamps in Africa. Even though they are massive, they can run faster than humans. With their eyes, ears, and nostrils on the top of the head, hippos can hear, see, and breathe while most of their body is underwater. A clear membrane covers and protects their eyes while allowing them to see underwater. Their nostrils close to keep water out, and they can hold their breath for 5 minutes or longer. Hippos can even sleep underwater, using a reflex that allows them to bob up, take a breath, and sink back down without waking up. They spend up to 16 hours a day submerged in rivers and lakes to keep their massive bodies cool under the hot African sun. They are herbivores. They like to eat grass, fallen fruit, sugar cane and corn. Yet despite all these adaptations for life in the water, hippos can’t swim! They move around by pushing off from the bottom of the river or simply walking along the riverbed in a slow-motion gallop, lightly touching the bottom with their toes, which are slightly webbed. Hippos have unique skin that needs to be kept wet for a good part of the day. Their skin produces red oily substance that protects them from sunburn. Like almost any herbivore, they consume other plants if presented with them, but their diet in nature consists almost entirely of grass, with only minimal consumption of aquatic plants. When they dive, their ears and nostrils close automatically. At sunset, hippopotamuses leave the water and travel overland to graze. They may travel 10 kilometers (6 miles) in a night, along single-file pathways, to consume some 35 kilograms (80 pounds) of grass. Hippos can store two days’ worth of grass in their stomachs and can go up to three weeks without eating. They have good eyesight, sense of smell and hearing. Despite its stocky shape and short legs, it is capable of running 30 km/h (19 mph) over short distances. They can see, smell and hear when they are in the water because their eyes, nostrils and ears are positioned on the upper surface of the head. The hippos is one of the most aggressive creatures in the world and is often regarded as one of the most dangerous animals in Africa. Their canine and incisor teeth grow continuously, with canines reaching 51 centimeters (20 inches) in length. Hippo males especially use their canines for fighting. Hippos are a very social species, living in groups of about 10 to 100. No matter the size, usually the group is led by a dominant male. Hippos spend most of their time in water because they don't have sweat glands and that is the only way to prevent overheating. Dominant male has the right to mate with all adult females in his herd, although he sometimes allows subordinate males in and around his territory to mate. Although breeding can occur year round, it is most common between February and August. Females have a gestation period of eight months and have only one baby at a time. When the female nears the time to give birth, she leaves the herd for one or two weeks to give birth to her young and create a bond with her baby. She is comfortable giving birth in water or on land.If the baby is born underwater, the mother needs to push it to the surface to breathe. Hippos live in group that consists of 10-30 animals. Group is called herd, bloat or pod. The mother stays in the water with her newborn for several days without eating, and she waits until her baby is strong enough before they dare leave the water at night to graze. For 18 months, the baby nurses while its mother is on land, or it swims underwater to suckle. Pygmy hippo is rare animals. At 5 to 7 years old, the hippo calf is fully mature. Female usually mate every other year, due cost of parental investment into the young. Occasionally lions, hyenas, and crocodiles will prey on young hippo.The adult hippo’s only real enemy (other than man) is his pool mate.They bite, maim, and kill each other.The bulls fight over females in breeding season and quarrel over water space at all times, especially in dry season. There are two types of hippos: common hippo and pygmy hippo. Common hippos are much larger animals. They can reach 12 feet in length and weigh up to 7000 pounds. Pygmy hippo can reach 5.7 feet in length and weigh up to 600 pounds. The IUCN classified the Hippo as having vulnerable status in 2008. The population is in decline; declining most dramatically in the Democratic Republic of the Congo. Hippos are endangered mainly because poachers hunt them for their meat and the ivory in their teeth. Other threats are habitat loss due to the encroachment of human settlements and the diversion of river water for agriculture. Hippos are one of the noisiest animals in Africa: some hippo vocalizations have been measured at 115 decibels, about the same volume as being 5 meters (16 feet) away from the speakers at a rock concert! Hippos vocalize on both land and in the water and are the only mammals that make amphibious calls. In African rivers, hippos look like floating islands, with birds fishing from their backs. Turtles and even baby crocodiles have been seen sunning themselves on hippos. Several fish species in Africa can keep busy feeding on the food remnants and dead skin cells found on the hippo’s skin. Hippos have stiff whiskers above the upper lip and some fuzziness around their ears and on their tail. A group of hippos is sometimes called a bloat, pod, or siege.